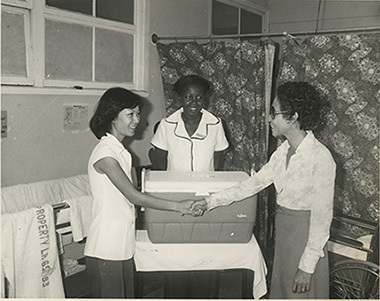 "Alcoa-Jamaica presented an ice chest to the Physiotherapy Department of the Spanish Town Hospital to be used for 'cold treatment' of certain ailments. Making the presentation on behalf of Alcoa was Mrs. Marcia Forbes [right] Community Relations Officer - Alcoa, while Miss Patricia Lue [left] Physiotherapist and Miss Monica Butts received the gift on behalf of the Hospital." NLJ Photograph Collection IN: Daily News Collection - Hospitals, Ja. Daily News, “Gift presentation to Spanish Town Hospital,” National Library of Jamaica Digital Collection , accessed April 20, 2019, https://nljdigital.nlj.gov.jm/items/show/5282.